Shakati Private Game Reserve - Vaalwater Accommodation. Shakati Private Game Reserve is hidden away on the lush banks of the Mokolo river in the deep heart of the untamed Waterberg bushveld paradise. Waterberg is registered as an internationally protected UNESCO Biosphere Reserve. Shakati Private Game Reserve is located 20 km west of the town Vaalwater, only 3 hours drive from Johannesburg. Time spent at Shakati Game Reserve is about getting away from city life, work, traffic and stress. It is about peace and tranquility, clean fresh air and clear skies. It is about being quiet and listen to the jackal calling at night, to the paradise flycatcher singing in the morning. It is about seeing and walking with the animals, touching the fruits of the bush willow -and wonder about nature. Shakati offers a 625 ha private game reserve with a small luxurious safari lodge. The main complex has seperate guest lounge, dining area, large braai/barbeque area, swimming pool and a beautiful, lush garden. The lodge has 3 fully equipped self-catering chalets with own braai/barbeque facility. 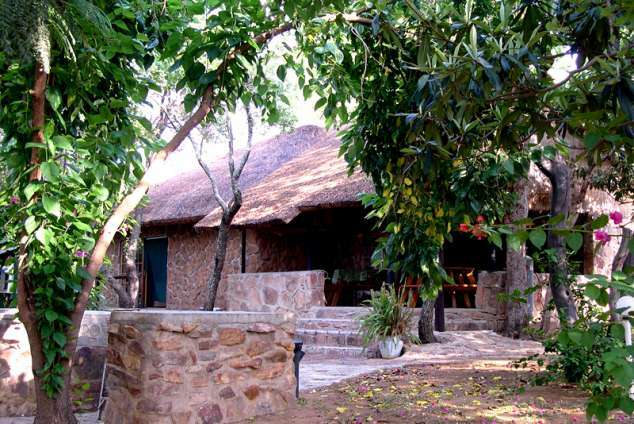 The lodge accommodates 12 people comfortably and 18 at maximum. River frontage, rocks and ridges, spectacular views and large indigenous bush and savannah areas. Plenty of wildlife - Giraffe, Zebra, Kudu, Gemsbok, Hartebeest, Eland, Waterbok, Blesbok, Warthog, Impala, leopard, Jackal, Porcupine etc. Due to the absence of Elephant and Lion it is safe to walk around in the reserve. Elephant and Lion you can see in the close-by Marakele national park. Prolific bird life - one of the highest bird diversities in the Waterberg with 270 bird species on the list. Waterberg is internationally registered as Important Bird Area (IBA) and Shakai is listed as a Birder Friendly Establishment. Hunting camp with hunting at neighbouring areas. Cell phone signal throughout the reserve. Internet cafe in nearby Vaalwater town. Three chalets: 2 bedrooms (twin plus double beds), lounge with 2 couches, kitchen with fridge/freezer etc, bathroom and outdoor romantic shower, private braai/barbeque area. Sleeps maximum 6 per chalet. Self-catering or catering: Catering on request. Game drives/walks: Go on game drives and game walks with the reserve manager. Discounts: The entire complex (maximum 18 persons) can be rented at a discounted rate. Enquire for 3 to 4 day midweek specials. GPS Coordinates Main Gate S 24°8'18.86" ; E 28°2'31.54"
When leaving the off ramp turn left (west) into the R33 west heading towards Nystroom app. 12 km away. Go straight through Nylstroom towards Vaalwater app. 60 km away -still following the R33. (In Vaalwater you can call the reserve manager Andre +27 (0) 76 866 3639 - he will then meet you at the reserve gate). In Vaalwater go right through the town and continue still a few kilometres until you on the left see SPAR supermarket and on the right a road junction saying R33-Ellisras/Lephalale (straight-on goes to Thabazimbi). Turn right following the road Ellisras/Lephalale road for app. 20 kilometers. Turn left at the Shakati Game Reserve sign/dwelling into the dirt road. Continue app. 2 kilometres to the (locked) reserve gate, where the reserve manager will meet you and let you in. Detail description : Shakati is a private game and safari reserve with own lodge complex, that accomodates only 12-16 persons. 3 guest chalets with 4-6 person in each. Self-catering or in-house catering by own Chef. Shakati is located in the heart of the protected Unesco Waterberg Biosphere Reserve just 3 hours drive north of Johannesburg. Beautiful river frontage with great fishing possibilities. 17782 page views since 19 Feb, 2010.